As you know I rarely post on the U.S. economy. But recently I was updating a presentation involving the state of financial flows for retail investors and savers around the world and had to check up on my old chart that I labeled America's Scariest Chart Redux (see previous update here). Keep in mind the dominant media meme: the U.S. economy has been growing at a robust rate and the Great Recession has been officially over now for 74 months. 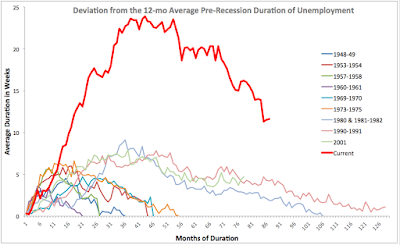 So where does the current unemployment duration (in terms of average duration in weeks) stand? Err... average duration of unemployment in the U.S. is currently at 28.4 weeks. 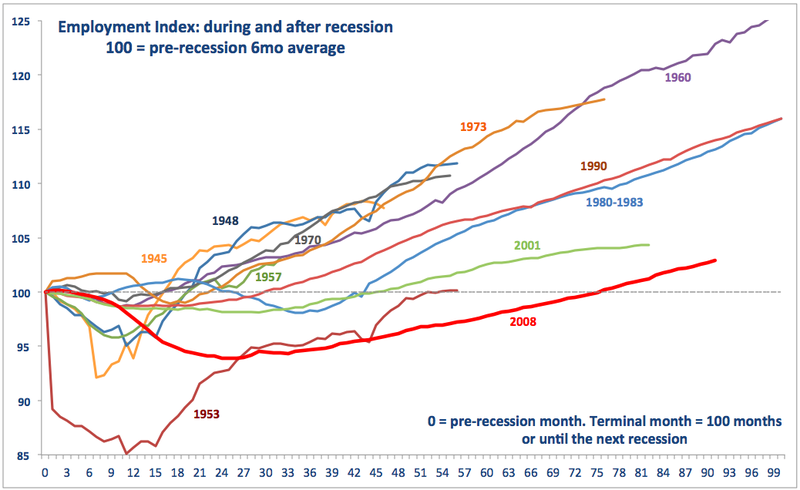 Over 12 months period before the onset of the Great Recession, duration averaged 16.8 weeks. 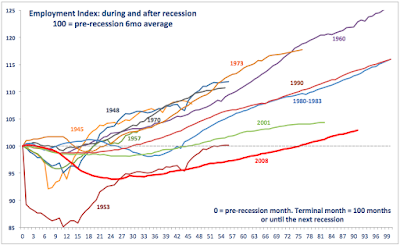 Which means that even today, a full 87 months after the start of the Great Recession, average duration of unemployment is 11.6 weeks longer than it was before the crisis. Current deviation from pre-crisis levels in average duration of unemployment is consistent with this measure of labour markets performance in months 17-18 of the crisis. Worse, we are now (still) in a situation where people on unemployment benefits are staying in unemployment longer, on average, than in any other recession on record. And guess what? The chart above clearly shows that the current period of 'recovery' is still the worst in terms of employment performance than any previous recovery on record.